"Blue Valentine was foaled in Benson AZ, on Kenny Gunter's Ranch. Dell Haverty bought Blue Valentine. Haverty's wife was a daughter of Buster Hayes of Thermopolis, Wyoming. Haverty took Blue Valentine up to Wyoming to the Hayes Brothers ranch & sold them 1/2 interest in him. During the Hayes/Haverty partnership, Blue would be hauled south in the late summer for Dell to use at the fall & winter rodeos in the southwest & for the early breeding season in Arizona. He would then be hauled back up to the Hayes Ranch at Thermopolis, Wyoming for the late spring breeding season & to rope on at Cheyenne Frontier Days & other Wyoming rodeos in the summer. Blue was used for roping, ranch work & steer tripping, when the calves weighed 800-900lbs. In 1968 Haverty's daughter barrel raced on Blue (he had never been run on barrels) took 3rd @ the annual Casper, Wyoming pro rodeo, an all-girl competition. Over the years, many members of the Haverty, Merritt, & Hayes families took their turn at competing on Blue Valentine, in rodeo events. In August 1980 he died, @ 24, from a ruptured intestine due to colic. The same month Buster Hayes was killed in an accident & none of the heirs were financially able to take over the ranch. It was sold & the Hayes Brothers broodmare band was dispersed. In 1983, Hyde Merritt was killed in an accident & his family also had to sell his ranches & most of the horses he had spent his lifetime breeding. Hyde's wife, & their son Chip, managed to keep some mares & two stallions. 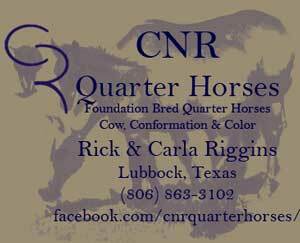 Chip has spent years rebuilding a Blue Valentine herd & legacy. Vince Hayes was also able to keep a few horses, including Leo Hancock Hayes, one of the last sons foaled the year Blue Valentine died. Leo Hancock Hayes is now owned by the Brookings in Texas. Blue Valentine horses are known for their gentle disposition, bone frame, good feet & minds. There are now only 2 remaining sons of Blue Valentine, Leo Hancock Hayes & Blues King Fisher. Blue was 25% Joe Hancock breeding." Blue Valentine passed on his sire's legacy of usability and functional conformation to the Merritt Horses of Wyoming. Hyde Merritt horses were popular with ropers for 25 years and the breeding is still found in many remudas in Texas, Oklahoma, Wyoming, and Nebraska. Blue Valentine's sire Red Man was a well-known sire of top ranch mounts throughout the Arizona cattle country. During the 1940's and 50's, the majority of usin' horse men were more interested in what an individual animal could do under saddle. The Red Man foals could do the job, out on the ranch, in the rodeo arena, and stayed sound while doing it. Red Man's foals earned 80 race wins, 18 stakes winners, earning a total of $28,848 back in the days when purses were low. He sired 15 Race ROM earners. Red Man had a long hip, was tremendously deep through the heart girth, had withers that would hold a saddle and lots of bone. 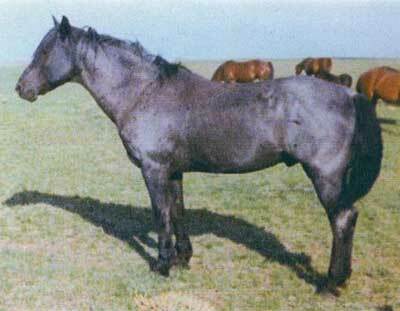 As a sire he passed that size and bone, athletic ability, roan color and good black feet on to most of his line. He was quick out of the box, could really "blow up on one" and after the catch was made and the slack rope pitched away, stop and get back. Red Man took to the event like a "duck takes to water", carrying on the tradition of the Hancocks as rope horses. Red Man was sired by the legendary Joe Hancock. Joe Hancock showed speed at a young age and before his racing career was over, Joe Hancock was open to the world at any distance from the starting line to three-eighths of a mile. He won his races by being so fast away from the line that the other horse couldn't catch him. There finally came a time when Joe Hancock simply ran out of competition. He stood pat at three-eighths of a mile, but no one wanted to take on the brown stallion. From "The Working Horse Magazine"